I’m learning edu-10 together with MPLABX with xc8 compiler using your included C example programs and it is very useful to understand the logics behind PIC microcontroller. How to configure MicroC such that the pickit2 in edu10 is recognized so that it can be directly accessed from Micro C? How to import for example your analog_to_digital C example to MicroC? Which library (headers) and the definition in main.c should it be used? I’ve included part of the example code in MPLAB, which runs succesful within MPLAB X. If we want to write similiar program in MicroC, how would it be look? C Compiler Demo for the EDU10 Board. This code uses the PIC16F882 ADC to read the value of the VDR, NTC and RV1. to value 000-255 and displayed on the 7-segment display. SW4: Potentiometer is used to adjust the buzzer tone pitch. You can use program PICkit 2 v2.61 to program and run the PIC using the HEX code generated in MikroC. 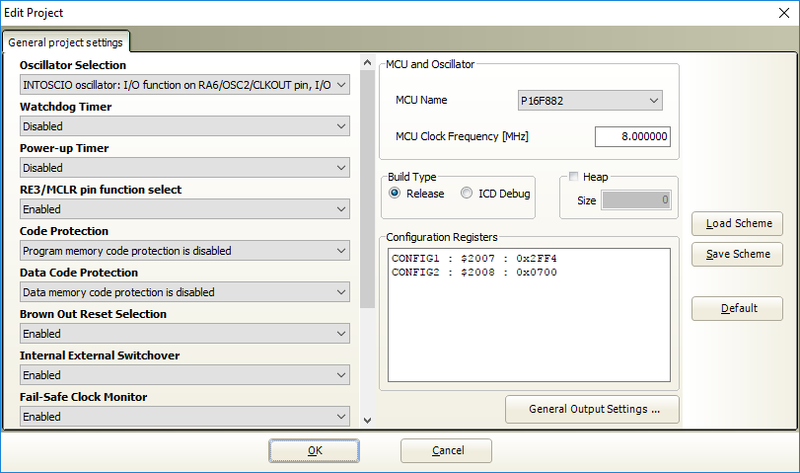 The configuration settings can be set using in MikroC Project->Edit Project options.